This video is sure to make you sit on the edge of your seat, where a buffalo bull can be seen stuck between a pride of lions and a group of crocodiles. This hair-raising video has gone massively viral with over 2.5-million views on Facebook with comments more than a lakh. According to NDTV, this extremely frightening incident was captured on camera by tour guide Thuli Khumalo, where a buffalo bull got stuck in a hard place - between a pride of lions and a group of crocodiles. The video of the buffalo fighting off its predators was shot recently at the Kruger National Park in South Africa. In the video, a group of lions can be seen chasing a herd of deer. Suddenly their attention, is captured by a lone buffalo bull standing at the water's edge. To escape from their attack, the buffalo runs into water without knowing the dangers of running into the jaws of a crocodile. As soon as the buffalo reaches the land after fighting the crocodile, he runs for his life with lions chasing after him. But luckily the story had a happy ending, where his massive herd of buffaloes came to his rescue. Without wasting much time, watch the lions, a crocodile and a buffalo battle it out at the Kruger National Park below. வெள்ளம் புகுந்ததால் ஊருக்குள் புகுந்த முதலைகள்.. பீதியில் அலறும் மக்கள்! 'இது வேற லெவல் சிக்ஸ்'...ஸ்விட்ச் ஹிட்டில் பந்தை தெறிக்க விட்ட அதிரடி வீரர்! Watch Video...பார்வையாளர்களுடன் சகஜமாக பழகும் முதலைகள் ! This page contains news relating to various facts and events. The views are generally about current affiars and general topics in diversified areas such as political, international, national, and regional issues, sports, health, travel, lifestyle, technology and business. People having similar interets on the above topics will find this page useful. 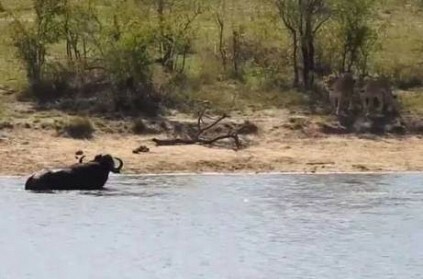 Buffalo fights with lions and Crocodiles at Kruger National Park in So | World News.